July 2009 | To Be, To Be. Tutubi. 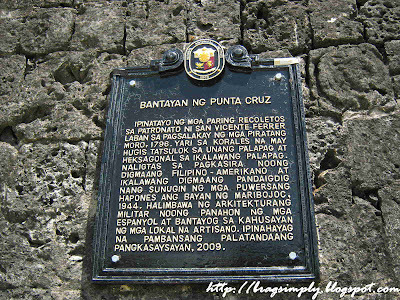 Ang Bantayan ng Punta Cruz sa Maribojoc, Bohol. Ipinatayo bilang proteksyon laban sa pagsalakay ng mga Moro. Kapag nasa itaas ka, kitang kita mo ang dagat at ang ganda talaga ng tanawin. isnag magandang bantayan talaga ito. 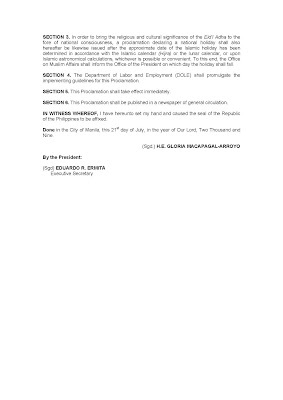 The President declared the Philippine Holidays for 2010 under Proclamation No. 1841 dated July 21, 2009. But I have completely forgotten to blog about it! For 2010, February 22 has already been declared a Special Holiday for Schools. 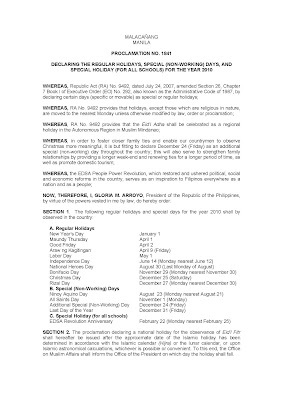 The only other holiday not in the list is the Eid'l Fitr which will still be determined by the Office of Muslim Affairs. So now that you know the holidays for next year, you can now plan your vacations ahead. Have you noticed how weird the weather has been lately? Last Saturday, we were in Rizal for a swimming party to celebrate my mother's birthday. It was sunny and hot. Then it rained at night, then was sunny again in the morning. Then come Sunday. It rained so hard we had a hard time going home as the road in Araneta Avenue was flooded. Now, it is sunny then later in the afternoon, it would rain so hard again. Weird, weird weather indeed. And when its sunny, its gets so hot and humid! I just wish I was in Arizona where the weather is just about right. But I have to check out how the Arizona real estate is so that I have someplace to live. Here’s a chance to see how well you really know your husband. Cut, paste and fill in the answers, then forward . . . shoot, you know what to do. TAG ME BACK! 2. You’re out to eat; what kind of dressing does he get on his salad? At Wendys, Thousand Islands? 4. You go out to eat and have a drink. What does he order? Before his hypertension a bottle of San Mig Light. 10. What is his favorite cereal? Is oatmeal a cereal? 11. What would he never wear? Umm, I don't know. Wow! 12. What is his favorite sports team? Ginebra. I think he would die for them or something. 14. Who are his best friends? Jingjing, Lanlan, his high school buddies. 15. What is something you do that he wishes you wouldn’t do? Nag. He he. 16. What is his heritage? Bisayang Ilocano -is this what you mean? 17. You bake him a cake for his birthday; what kind would it be? Me Bake? No. I will cook pansit for him. 18. Did he play sports in high school? Just the usual basketball. Well, I just realize that after 11 years of marriage, I know my husband quite well. As for what he will never wear, I guess I have to find that one out. Have you ever wondered how it would make your husband feel if you order a supercharger for his car? My husband would be super delighted! If yours drive a Mercedes, why not order for him a Mercedes supercharger? His ride will be the envy of his car owner friends! And even if you are the one to deal with the supercharger professionals, Superchargerpros.com, you wont have any problems with them because they offer superb customer service and great prices. Now, would you consider it a gift idea for your husband? Me, Ia guess so. If you need a Pontiac Supercharger or a Buick Supercharger or for other car brand and models, Superchargerpros.com can help you with their wide selection of new and remanufactured parts. What is a Tutubi blog without its very own pictures of a Tutubi? 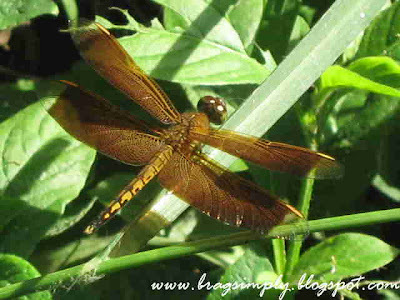 A Tutubi or Dragonfly has been one of my favorite insects as they bring back happy and carefree childhood memories while growing up in the province. 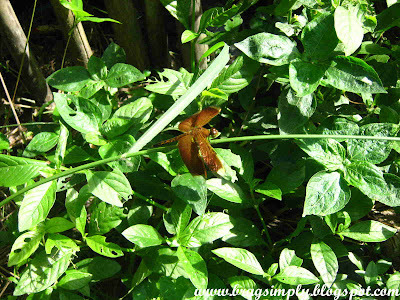 As a child, I can remember chasing after tutubi and tipaklong(grasshopper) in the field my grandfather tended. Oh we had so much fun then! Last Saturday, we went swimming in Montalban to celebrate my mother's birthday. The resort was almost empty except for 2 other groups and so it was quiet, without the usual blaring karaoke sounds. 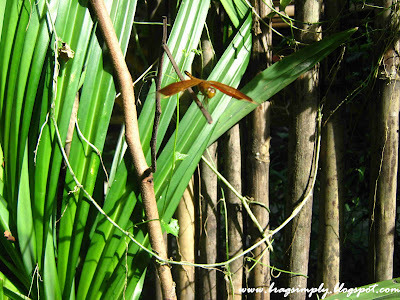 I explored the resort and saw some butterflies and dragonflies. I saw one and hurried to take pictures, afraid it would fly away. But this one posed for me! I managed to take maybe 20 photos, but of course they couldnt quite capture the beauty of this creature. But I am still very happy to finally managed to have a Tutubi picture for this To Be, To. Tutubi blog! "Nakakakilabot" ang tema para sa Litratong Pinoy ngayong Huwebes at heto ang aking lahok. 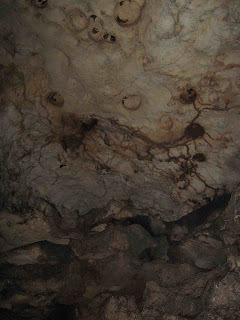 Kuha ito sa Hinagdanan Cave ng pumunta kaming muli sa Bohol nuong nakaraang buwan. Nai-imadyin mo ba kung mahulog ka sa kuwebang ito mula sa itaas? Sabi-sabi ay ganun nadiskubre ng may-ari ng lupa ang kuweba. Pero heto kami ng aking irog, hindi naman kami mukhang kinikilabutan di ba? 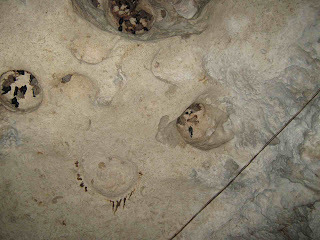 Nag-enjoy nga kaming mabuti sa Bohol e.
Kung nais nyo pa ng ibang nakakakilabot na litrato, punta kayo sa Litratong Pinoy. I was a working student back in college and my very first job was as a service crew in Cindy's Hamburger in Baclaran. My work shift was 12pm to 6am, graveyard shift and my school schedule was from 9am to 6pm. Yes, I also didn't know how I did it, but I even lasted more than a year on the job. It was a fun shift, and very challenging. Our store manager would disappear to the stockroom around 1am " to do some inventory" and we will see him again around 5am. Our usual customers are drunk patrons and their dates from the nearby beer clubs in Baclaran. And since Cindys was a fast food restaurant, we always had trouble telling the customers to order at the counter. Sometimes, the customers were so drunk we will just give them and their dates a bucket of chicken and rice and soft drinks. But boy, these guys tip generously and so we always had extra money every morning. One time, the whole shift before us, 6a to 12nn, went on an out of town trip and failed to return in time for their schedule. Some of us who had no class were required to go on a straight duty because nobody else was available. I had never understood the word dead on your feet until then. Aside from the job itself, there are also other challenges with working in fast food chains. I had some co-workers who would rather go on overtime than go to school for more money. They end up quitting school, even if the job is also temporary. Some however get into relationships early on, sometimes ending up pregnant. But there are still many who still do good in school even while working. Me, I came out alright. Now, why am I writing about this? See, my sister is a freshman in college and I was thinking if I should let her work, knowing from experience how it is. My fear is that once she is earning money on her own and not dependent to me and my mother for allowance, she will be difficult and may neglect her studies. My sister is a very responsible and active student in high school and is an officer in her school org now, but should I allow her to work also? Do the benefits outweighs the risks? Ps. When I was working in Cindys, the logo was red. Wala lang. I had no problem with cooking before. I love to eat and I love to cook . However, I have a picky grade-schooler and a hypertensive husband and I am watching my weight (or I try to). The grade schooler bring pack lunch to school and it is a problem really on what to cook for him. And I had to learn new dishes that are good fr my husband. But the real problem with my cooking is that I have no sense of smell. I had a Functional Endoscopic Sinus Surgery or FESS some years back because of blocked sinuses and my sense of smell now is, well, intermittent. Some days, I can smell just a little bit, and most days, nothing. And you can never really be good in cooking without it. So my cooking is a little hit and miss lately, and though my husband (bless his heart) never complains, I feel sad about it. There so many things to be thankful for everyday, and today I decided to list down ten random things that absolutely made my day. 4. An office mate who split her lunch in half and said "hating-kapatid." I could list down a lot more reasons to be thankful for today and I realize, despite whatever problems I may have, it really is a beautiful life! Commitment is what transforms the promise into reality. It is the words that speak boldly of your intentions. And the actions which speak louder than the words. It is making the time when there is none. Year after year after year. The power to change the face of things. It is the daily triumph of integrity over skepticism. Colorado Ski Vacation? A dream come true! That is what it would mean to me! See, the Philippines is a tropical country and cliche as it may sound, I want to experience snow and everything that Colorado has to offer. And a ski vacation would just be heaven! Four days and five nights at Winter Park Resort with cozy lodging and private coaching from a former U.S. Ski Team member. This all-inclusive ski vacation includes round-trip air fare, four days of skiing at Winter Park Resort, lodging for five nights, and private coaching for up to six skiers. 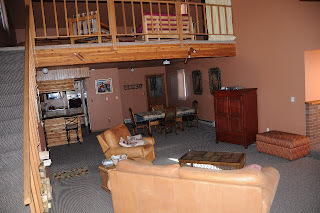 You will be staying in a beautiful three-bedroom (plus loft), two bath house that comfortably sleeps six people. Along with this wonderful cabin you will also be receiving two full days of private coaching with a former U.S. Ski Team member. I am thinking that our little group of friends from College would be all dying for a trip like this. And if they are still not convinced, then the photo of the Winter Park Resort would do the trick. Can you imagine how cozy and relaxing this is after a fun-filled day of skiing? Of course, there are also options to customize your vacation to include skiing, climbing, rafting, hiking, and so much more and experience what Colorado has to offer. For the faint-hearted, since these are all physical and strenuous activities, you can also opt for more a relaxing vacation liking biking, camping and shopping. Or combine all of this for a really a dream vacation! Wow, what else could you possibly look for in a vacation? Tingnan mo ang katawan ng punong ito, akala mo tuyo na. Sa kulay ng balat nya, halatang matanda na at matagal ng panahong nabubuhay. Pero, sa isang sanga nya, buhay na buhay ang mga halaman tumutubo. At kung titignan mo sa malayo, kay yabong ng kanyang mga dahon at kay lawak ng nabibigyan nya ng lilim! 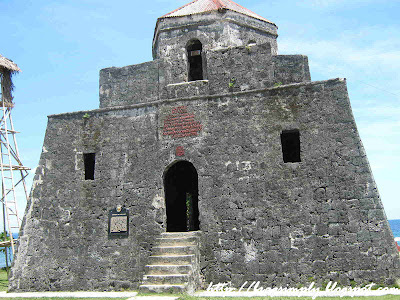 Kuha ito sa Dauis Church Complex sa Bohol. 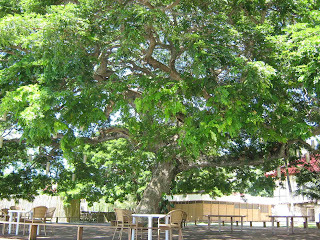 Ito yung giant acacia tree naibigang mabuti ni Market Man, kaya nga pilit namin siyang pinuntuhan ng mag-Bohol ulit kami last month. Ito ang lahok ko ngayong Huwebes sa Litratong Pinoy. I was wondering yesterday whether it was okay to watch Harry Potter and the Half Blood Prince after telling my son that watching Transformers 2 was just not worth it and last night, I thought of the perfect solution to the dilemma. Eldest and Mommy will watch the movie tonight, the husband will stay at home to watch the 7th and final game of the PBA championship between Ginebra and the other San Miguel company, and the younger kids will stay at home to do some kid stuff after Mommy promised to buy them some clay! Its the perfect solution, don't you think? Yes, I think Harry Potter and the Half Blood Prince is worth my time and money (but only for 2, he he). This is what we call compromise. Ha ha! There is a new Facebook application that is a sign that even online, we need to connect with other people. InTheRooms Facebook App is a way to connect, as humanely as possible, on the Internet. We cheer on our friends for being in recovery and the longer the time he has been in the room means that he is on the right track. We all need encouragement and support and this app is a very useful way to show our concern. InTheRooms is a new app that you can use to share your recovery time from your addiction and share with your Facebook friends. You can add the time you are in recovery, and choose to share it in your profile. Of course, you can choose to be anonymous and not to display the box. Still, this app makes you part of a community and support group. You may be wondering why this app is called In The Rooms? It is a euphemism, for people meeting anonymously, gathered inside a room. As part of the group, you can just say, hey I am In the Rooms too! This is a cool app, I tell you. So if you need be In the Rooms, log on to Facebook and check it out now. Should I Watch the Harry Potter and the Half Blood Prince? Here lies the problem: my eldest son wanted to watch Transformers 2 two weeks ago but I did to him the Math: 5 x P130 for the movies, P150 for the cab, 5xP100 for the snack and I told him Transformers wasn't worth it. We should just wait for the DVD to come out. 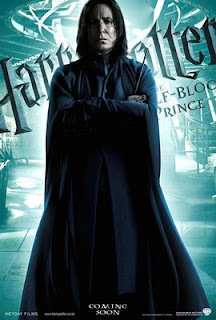 Now, Harry Potter and the Half Blood Prince will be showing on Thursday and I am so dying to see it. I have not missed one single HP movie on theater and I don't want to miss this one. But after doing the Math to my son, how can I tell him that I want to watch this movie? They know that I am a HP fan: I have the books and the DVD to show for it. Now, what's a mother to do? Inspired by the Daily Top Ten at RX 93.1 on which is better, Twilight or Harry Potter, I just have to say my piece. For me, Harry Potter is the better series, book or movie. There are just too many reasons why. 1. I wouldn't mind my kids reading Harry Potter for its lessons on friendship, humility, love, loyalty and strength. As for Twilight, sure Bella and Edward have redeeming qualities, but HP has more for them to emulate. 2. In Harry Potter, you are taught not to judge people by how they look or by the accident of their birth (pure blood or not). Okay, Twilight does that too; do not judge Jacob because he is a werewolf and the vampires because they are. 3. HP's character are more noble. In Twilight, Edward and Bella brought all the problems or trouble upon themselves because they fell in love while Harry Potter had no choice. He was born to all of this. I will update this every time I think of a reason why I love Harry Potter more. What about you, which one do you prefer? I am currently reading the books on True Blood, but the story doesn't grip me as much as HP or Twilight. I don't know, maybe I had my fill of vampires and wizards. After 3 kids, I am still as vain as the next woman. I still want to look good for my own self esteem. It's a fact that after pregnancy, our body undergo physical changes and sometimes no amount of physical exercise can make us look as good before. And since I recently lost some weight there are really just some body parts that could use a little help. And I am willing to go for it, just like any thinking woman. I am talking about breast enlargement. After three pregnancies and the subsequent breast feeding, I admit to needing a little help. And I believe that having a breast enlargement surgery will boost my self confidence. It is a very simple procedure where an implant will be inserted through a small incision in your breast. You only have to stay overnight in the hospital to monitor the success of the operation. It is fairly a simple procedure, right? Then why is breast enlargement surgery one of most maligned and ill-understood procedure? I personally think that this is because some women,wanting to look good, fall prey to quack doctors who promise good results then performs the procedure under suspect conditions, which usually produce negative and sometimes fatal results. So once I have the budget, it doesn't matter whether MYA Cosmetic Surgery is in the UK. I will only trust my body and peace of mind to reputable and competent doctors. If I want myself to look amazing, then I will travel to UK to get the surgery done, and done wonderfully. The most beautiful niece in the whole world celebrated her third birthday last July 9 and we were in their house over the weekend for the party. Yes, she is the most beatiful niece in the whole world. The other child of my sister is the cutest nephew in the whole world also. 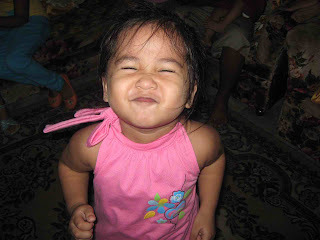 Ha ha, I am one proud Tita! She is now 3 years old and is super sweet. My sister and her husband waited 7 years for her and she was really worth the wait. She is such a lovable and adorable kid. Her sibling, Micko is also a darling boy and I surely love them both. My husband was having a hard time with our TV last weekend when we were in Rizal. We don't have cable TV there yet and I'm sure we wont get one now that I have discovered Satellite TV. You know how hard it is to get a new cable TV subscription, as though you wont be paying for the services? Well, now with DirecTV you will get free equipment and free installation as a new satellite TV subscriber. No more dealing with cable TV operators who know nothing about customer service! My husband will surely be ecstatic over this not not only because they are the leading provider of HD programming but also because they offer 100% digital programming and superb customer service! And the kids will surely enjoying watching Satellite TV because more channels are available and they have better picture quality. So if you are the only left with a cable TV subscription, better say "good riddance" now and switch to Dish Network! Kuha ito sa isang palaro nuong Fiesta sa amin last June 8. 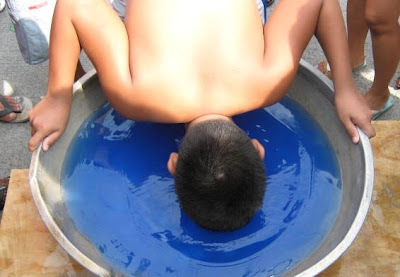 May mga barya sa palanggang may tubig na kinulayan ng asul na jobus. Oo, siguradong basa ka dyan anak! 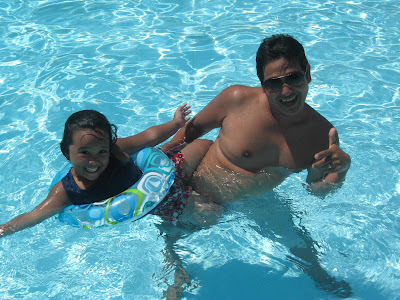 At eto naman ang aking mag-ama, na animo'y may coordinated na moves sa pagswi-swimming. Kaya hayun, matapos ang swimming, parehong sunog! Not only is running good for you because of the health benefits to your body; the fun and camaraderie and having your picture taken with Mr Lance Gokongwei himself, but also because of the prizes. I forgot to blog about my loot during the fun run. 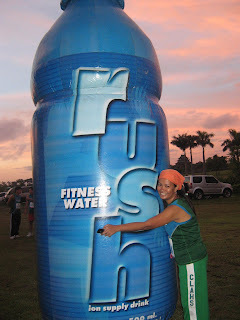 No, not that big Rush bottle, but I wish! These are my loot. 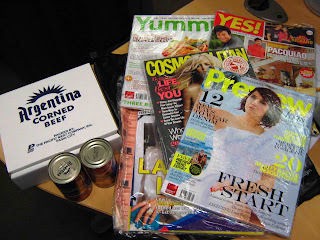 A six-pack Argentina corned beef and Summit Media magazines.Not bad for a fun run right? Not that I really need those prizes to motivate me to run, but it sure was good to receive them. Now, if only my husband will be cleared by his Cardio following his recent bouts of hypertension, dizziness and nausea, then we can start running again. We were watching Slum dog Millionaire again last night and my husband wondered aloud why he didn't see any men wearing traditional Indian clothing. I asked him if he would like to wear one and he said why not? We looked at these Men's Wear from India and I had to agree that he would look quite "The Man"in the photo above. Good thing searching for Indian and other ethnic clothing is now very easy, thanks to Utsav. And aside from the many reasons why you should try shopping online here, they also teach you how to wear a Sari! I have always wanted to wear one. Now that is very cool! Update: July 13, 2009: July 27 is now a Working Holiday according to this clarification. A forwarded email entitled "Holiday" reached my mail box today. It was about the declaration of July 27 as a non-working holiday to commemorate the founding of the Iglesia ni Cristo. Here is the link to the news from Inquirer, although I cant find it in the Philippine Govt website yet. Anyway, according to this Wikipedia article on Iglesia ni Cristo, it was founded in July 27, 1914 and is now celebrating its 95th year. Congratulations and thank you for another long weekend. Now, I can make plans to travel and maybe join the Wandering Juan contest. "Giving Your Home a New Face Lift." That is the battle cry of this Chicago remodeling company and I love their idea! If I have the budget, I would really love to remodel our house to give it a new and fresh look. My initial idea for a remodeling project would be to change the look of the kitchen, have it re-painted green and have new cooking gadgets installed. Now, that would really make my house looks new! And imagine what I could cook then! My husband and I have often dubbed ourselves the Weekend Warriors or the DIY wannabees because we experiment with painting our small house and making cabinets (or so we like to call those small wooden boxes). But those little experiments really makes a lot of difference, as though the house has been given a new lease in life! Ha ha. Now can you imagine if you have the budget and you can hire the services of Budget Pros remodeling contractor? Of course, if you don't get a reputable contractor, that would definitely mean a lot of headaches but good ones like Budget Pros will make your remodeling a breeze. But before you plunge in, make sure to work out a plan with your contractor. You must make sure to have a budget and a timetable and stick to it, otherwise this remodeling project that you think will make your house look new might make it look like a battle zone. Again, make sure to find a contractor that provides excellent service but within your budget to give your home a new face lift! 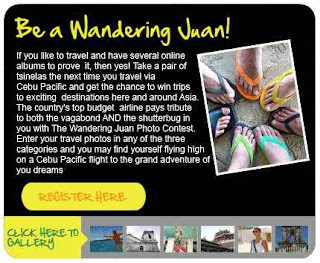 Cebu Pacific is introducing its new photo contest, The Wandering Juan! 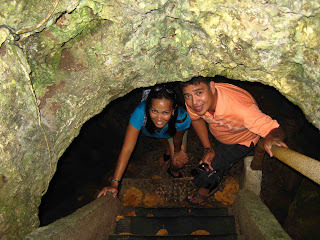 All you have to do is bring your Tsinelas and trusty cameras when you travel to any local or foreign destinations (where Cebu Pacific flies) and take your memorable travel photos. Category 3 TRAVELOGUE Round trip tickets for two (2) to Kota Kinabalu, Malaysia. 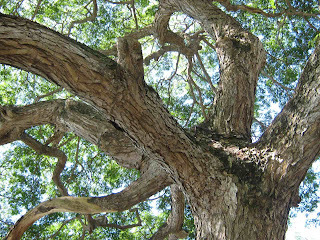 Photographs take from July 1 to October 31, 2009 are eligible for submission to this contest. 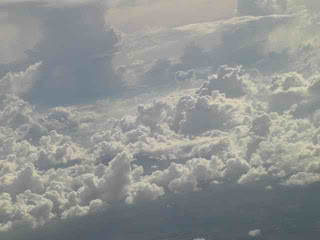 Of course, you must have flown to the destination via Cebu Pacific since you need to present the purchased tickets. For complete mechanics, visit Wandering Juan. I am excited to join this contest. 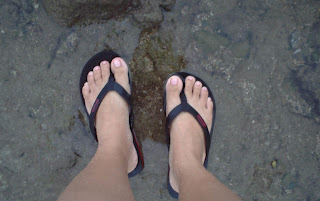 I love taking Tsinelas pictures from my travels. So if you are a travel bug and photography buff, join the Wandering Juan Photo Contest now! Cooking for the hypertensive husband is going to be a challenge. He was told to eat more vegetables and fish and cut on the meat. So now, I am going to cook meatless vegetables and fish and my first dish is this Ginisang Pechay at Tokwa. I have a confession, this is not really that healthy because the Tokwa was deep fried. Oh well. Let me know how make this a more healthier dish please. 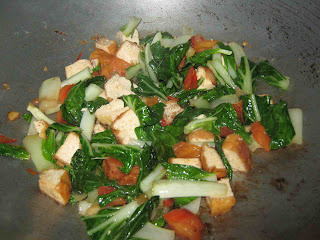 Cooking this Ginisang Pechay at Tokwa is really very easy. 1. Deep fry the Tokwa and cut into cubes. Set aside. 2. Saute garlic, onions and tomato. Then add the cubed Tokwa. 3. Add the Pechay and a little water, and season to taste. 4. Simmer for 2 minutes and you're done! Of course, you can add some meat if you want, or add some meat stock instead of water. You can even use oyster sauce or Patis as seasoning. Remember my husband's poorly managed hypertension? He had another episode this week and had to change his medication into a stronger dose. However, he is complaining of palpitations and he is now with his doctor to check if he should switch back to his previous medicine. I know, his hypertension really is poorly managed. 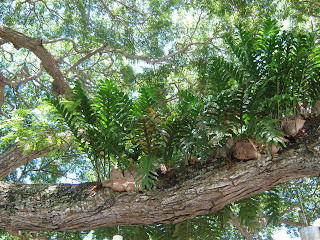 The above plant is commonly known as Pansit pansitan and it can be found near any garden plants. 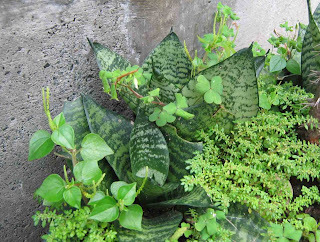 This one is taken in my neighbor's dish garden. I was told by well-meaning neighbors to boil the pansit-pansitan and have my husband take it as a tea, every morning and night. I made this into a tea for my husband last night and he said it doesn't taste bad. I am not really a fan of herbal medicine but since Pansit-pansitan has been recognized by the Department of Health among its list of 10 scientifically validated herbal medicinal plants, then I am okay with it. If you guys have a bad experience with Pansit-pansitan, please do share here. In this time of economic crisis, we must invest our money wisely. If you have a home or a property that you would like to rent out or lease, you must be prepared and armed with information. It will help a lot if you can rely on an expert Real Property Management company, especially one that has been given the "Franchise of the Year Honarable Mention." RPM Midwest is a reputable company that has also been featured in BizJournal and is a member of the National Association of Residential Property Managers. They have also signed an exclusive agreement with Freddie Mac for a REO Rental initiative. So if you want to be sure that you are getting the best deal out of your property, better check out Real Property Management. 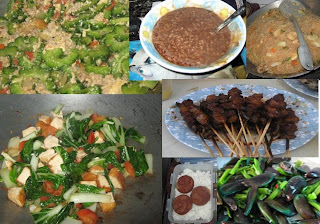 We went to Montalban yesterday because we had no work, July 2 being Pasig Day. Husband was not feeling too well to drive our motorcycle so we rode the jeepney. And boy was it so inconvenient! It was so hot and traffic was really bad. On the way, I was telling my husband to do better in looking for used cars so we can already buy one. We were discussing the merits of new cars and car lease while stuck in traffic and we both agreed that while they are very good and sound options, now may not the best time for us to explore them. Anyway, I told him about this car website, Buy Your Car UK and that I fell in love with these Used Audi Cars. 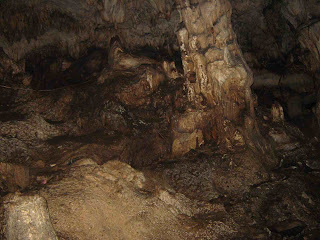 He agreed to take a look at them, and I only hope that we have such sites here in our country. While searching for used cars takes a lot of patience and some would even say that it takes a good measure of luck, it is really possible to find a great bargain. So if you are interested in looking for a variety of used cars, car lease and even new ones, vist Buy Your Car Uk.